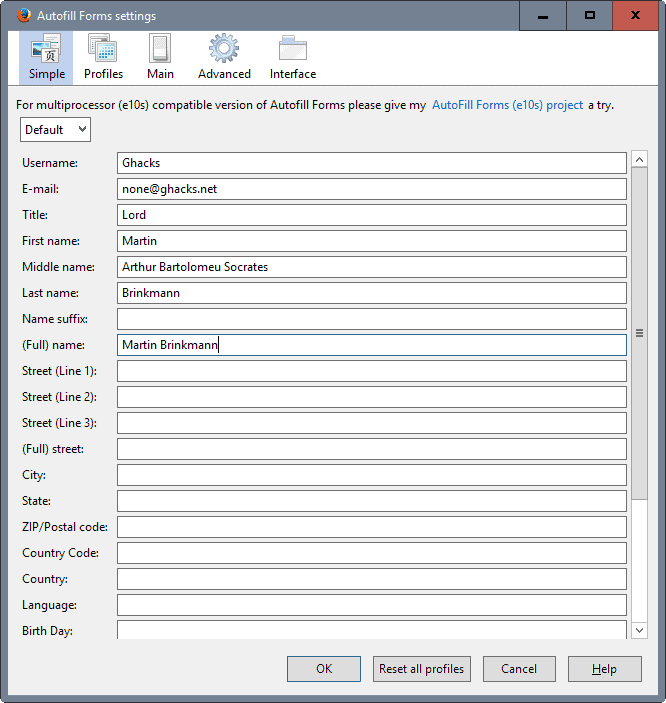 Autofill Forms is a free browser extension for the Firefox web browser that adds form profiles and management to the browser. I regularly register accounts on websites that either force me to register to leave a comment, or that offer such great value that I want to join to become a member of the community. The signup process is always the same. Enter a username, a password, a valid email and if you want several other information about yourself to complete the registration process. Similarly, on shopping sites, I have to fill out various information such as my name, street address and zip code to create an account. If you do that regularly it becomes a tedious time consuming process. I like to automate stuff like that. Autofill Forms is a Firefox extension that lets you fill out web forms with the click of the mouse / pressing a keyboard shortcut. It is possible to create profiles in case that you are using more than one identity on the Internet, or use the extension for work and spare time. You can fill out a lot of variables like name, username, street, city, phone and several others with the option to add new ones to that list or edit existing fields. This is important because the extension associates form field names to forms on the website (e.g. username to username field on websites). By default it assigns the birthday to forms that have the name byear, birthyear, birth-year or dob-year. It would be possible to add 'date of birth' to that list and every other phrase that comes to your mind that sites might use as an identifier for the field. First thing you may want to do after installation is open the settings. This allows you to enter data for the default profile, and add other profiles to the add-on as well should you need them. The extension adds an icon to the Firefox main toolbar that you may use to switch between profiles. You may import and export profiles so that you only need to create them once as you may export them for use on other machines or backing up purposes. The main tab allows you to add or remove fields from a profile. Each field consists of a name, field rule and site rule. Field rules define field conditions that need to match for Autofill Forms to fill out that fill. The site rule editor on the other hand lets you whitelist sites or patterns you want the data to be entered on. It is possible to set rule priorities and add site specific rules. Profiles can be exported which is excellent if you work with different computers. The default keyboard shortcut for filling out a form is ALT + J.
Autofill Forms is an excellent add-on for the Firefox web browser that adds a complete profile-based form filling solution to Firefox. Mozilla announced recently that it is working on integrating form filling natively into Firefox. I’ve been using the Google Toolbar AutoFill option until now. Thanks for ‘filling me in’ on this extension.